To burn or not to burn that’s still the question. However, that’s definitely not the case. 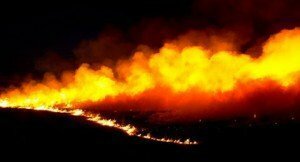 True, there have recently been considerably more than normal pasture fires throughout the Flint Hills, both planned, and those uncoordinated that got away. But, there are still considerable native bluestem pasture acreages that have not been singed this year. Exact percentage is seemingly incalculable, yet likely substantial. The comment has been repeated frequently for more than two weeks, and even oftener in the past few days. “I like to have damp and moist soil, so the regrowth is quicker,” evaluated one closest to proper grassland management, both professionally and personally. “I haven’t burned since 2011, and I do intend to burn my pastures,” said David Kraft, from his personal side living at the Flint Hills ranch where he was raised on the Greenwood-Coffey County line near Gridley. “It’s definitely not too late to burn, and would certainly be beneficial even for the next couple of weeks, if the conditions are enhancive. But, there can be severe crown damage at the base of the plants if there isn’t enough moisture,” clarified Kraft from his professional chair as state rangeland management specialist for the National Resource Conservation Service (NRCS), headquartered at Emporia. Timeliness of burn date actually takes into consideration many different things, according to Kraft. Of course, moisture conditions play into that picture, but urban publics’ concerns and environmental issues have an impact as well, not something that was ever thought about much, even as recent as a decade or two ago, the specialist informed. “Ranchers are well aware that when everybody burns about the same time, the smoke accumulates heavy into the atmosphere where in conjunction with elevated temperatures, nitrous oxide can be formed causing air quality issues,” Kraft explained. “So, there has been a dedicated effort by land managers to plan and coordinate pasture fires to reduce that smoke concentration and help ease those public concerns,” he added. Wildlife benefits from early burning grassland. “While burning earlier in the season is not as beneficial in pasture brush and weed control, it can be better for wildlife habitat.” Kraft said. Taking that into consideration both of those aspects, date of burn, with cooperation from weather and wind conditions, generally still depends somewhat on the goal of the land manager. “Traditionally, a prescribed burn when there is one-inch of growth of dominant big bluestem and Indian grasses improves and increases the vigor of species while giving an advantage of performance on grazing cattle, a primary reason for burning – which delays maturity in species up to a 90-day period,” Kraft said. Type of cattle intended for grazing affects importance of grass quality. Highest protein and maximum gains for yearlings will be the first 90 days of a season, with protein typically declining about the first of July. However, for full season stock grazing, the reduced nutrition level isn’t quite as significant, and neither is it generally a major factor with grazing cow-calf pairs. “Now, I’m personally going to be grazing dry cows, so the protein level is even less important. And, therefore, if I’m unable to get the pasture burned, it’s not as much of an affect economically as looking for pounds of gain,” commented Kraft, noting that native grass has 70 percent of its growth by July 1. “Native grasses replace approximately one-third of their roots annually. Heavy forage removal in the second half of the season can diminish root development, and also have an impact on the next year’s production. Plants need to finish the growing season well,” Kraft said. “Two years ago, the season was much earlier than this year, and many pastures even had growth enough for cattle to be out grazing by now,” Kraft reflected. Noteworthy is that the Flint Hills growing season starts earlier in southern counties, consequently the ranchers there will burn a week to 10 days before, and have cattle grazing that much sooner than even turnout in Lyon County. Wildfires can create grazing inconsistency in pastures. “Certainly, cattle will go to an area that has been burned in preference over unburned prairie. It’s generally best to try to burn the remainder of a pasture as quickly as possible after there has been a partial burn. “Taking too long after to burn the unburned acreage will often create extended grazing of the later burned area,” Kraft advised. However, significant, there is research being conducted with success on patch burn grazing. “One-third of a pasture is burned one year, another one-third the next, and the next. Cattle will select the higher nutrition; the remaining two-thirds of the pasture essentially gets two years of rest,” Kraft detailed. Brush invaders such as blackberry, buckbrush, sumac, multiflora rose, hedge and locust need growth for burning to be most effective in control. “There should be apparent leaf growth, and that is generally later in April,” Kraft advised. Red cedar, a terrible invader to the Flint Hills, is different. “Burning will be helpful in reducing cedar infestations from February through late summer,” the specialist claimed. Actually, chemical control can complement burning native grasslands. However, Kraft prefers to administer control by proper grazing and the use of prescribed fire over chemicals, when possible. “It’s been said that it doesn’t do any good to apply herbicide applications to brush invaders in pasture that has been burned, but that’s not the case all of the time. Rather, the applications are more effective when applied later than for those grasslands that haven’t been burned,” Kraft clarified. Depending again on the season and the year, these applications can be beneficial from late May through mid-June, when there are leaves on the intruders. “Still, one variable is buckbrush, which has a shorter window for herbicide control. After buckbrush has developed leaves with a waxy surface, there is sharply reduced effectiveness of a chemical application,” Kraft prescribed. “Sericea lespedeza, a noxious weed in Kansas, remains a threat in the Flint Hills,” Kraft recognized. A legume, sericea lespedeza contains a high concentration of tanins, which is largely indigestible to grazing animals, the specialist described. “It is also a very prolific seed producer such that mature plants can produce enough seed in a season to cause many years of management headaches,” Kraft warned. Such a menace, “Prescribed fire has very little negative impact on sericea lespedeza. Controlling the undesirable plant requires vigilance, and the use of ‘outside-the-box’ thinking. Untraditional burn season as well as chemical applications have shown the most promise of management or control of sericea lespedeza at this time,” Kraft explained. Seemingly endless are invaders on Flint Hills bluestem. “Kentucky bluegrass and brome grass can eventually overtake native pastures if not managed. They are a constant challenge, but populations can be sharply reduced with later burn dates,” Kraft insisted. However, a bigger challenge and most obvious concern to the specialist is Old World bluestem. “It is an extremely competitive grass, with a very fast rate of spread, and a huge threat to the Flint Hills. The grass is somewhat palatable, but it will crowd out the other more desirable native grasses,” Kraft related. Additionally, Old World bluestem is not native to the United States, but it is a bunch grass that has been planted in southern states, because of fast growth and hardiness under harsh conditions. “There’s poor cover, and increased erosion,” Kraft emphatically added. Never recommended by NRCS as a grass to plant in Kansas, there were seedings by some producers which has expanded the growth intrusion. Threeawn is another problem for ranchland operators. “There are several varieties of threeawn that especially can be a problem in ‘go-back’ pastures and bluestem hay meadows. Burning threeawn in the fall destroys the seeds, but not a lot of ranchers do that because it leaves the ground barren and erodible. “Burning threeawn and then reseeding the area to native grass can work well, yet that requires patience to get a new stand established,” Kraft verified. Although some of an earlier generation may have considered native grassland as a “no or little management” part of agriculture and ranching, obviously it is far from that. “Unmanaged, Flint Hills can become a timber,” Clinton Owensby, prominent rangeland researcher, contended four decades-plus ago. Obviously, there has been brush intrusion into once entirely lush prairies. Stocking rate has a definite impact on grasslands, too. “Traditionally, stock rates have been largely passed down from generation to generation. Many times, they are extremely accurate, but sometimes they should have some tweaking. “Ideally, producers should have an understanding of what forage production is in each pasture, because every pasture is created differently. The relationship between soils and plant communities tells the whole story. “We know what the animal requires, and it is our job as cattle producers, and caretakers of the land, to match the animal to the grazing environment with a goal of maintaining or improving that grazing resource for the next generation. “Caring for our Flint Hills, the last surviving native grassland in the world, is an unending challenge, but ranchers and landowners are working diligently to maintain and improve our bluestem pastures,” Kraft summarized. Photo of rangeland fire in Lyon County thanks to Matthew Fowler, Emporia Gazette.